Mazda 6 Forums : Mazda 6 Forum / Mazda Atenza Forum > Mazda6 (Atenza) > Mazda6 (Atenza) > 3rd-Gen > Aftermarket support for 3rd gen+??? 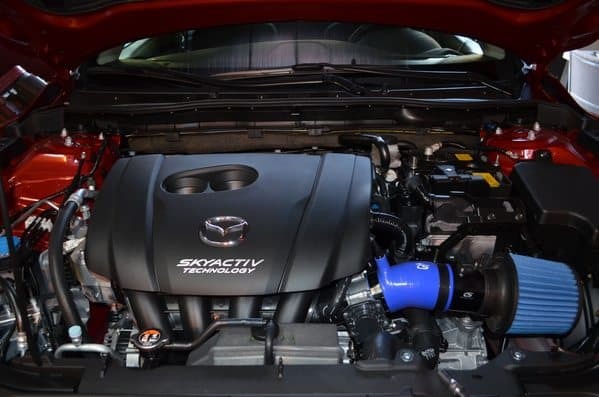 "In initial testing on the 2014 SkyActiv Mazda 6, the CorkSport SkyActiv Short Ram Intake netted peak gains of +9hp and +12lb/ft of torque." That's awesome, I honestly don't expect much aftermarket with the Mazda6 as much I would a speed3/6. I might consider a few mods and perhaps squeeze a little extra hp out if needed. I would mind having 200hp/tq but $179 for 9hp/12tq is spendy considering I doubt you will feel the power difference. Last edited by MaxCarnage; 03-07-2013 at 01:06 AM. An aftermarket hood gas strut kit can't come soon enough - that lid weighs a ton! Aftermarket support for 3rd gen+??? Agreed, although I don't lift the hood all that much. The Mazda6 makes 184 hp, and if this adds 9hp that would put it to 193hp. I'm sure someone can find a simple mod to squeeze out another 7hp. We are talking 200hp not 200whp. It's only 16hp off from 200hp, I think it's easily doable. If someone like Cobb comes out with a reflash tune for it I think another 7hp can be made from that or perhaps in the exhaust system. Ooo, a re-flash tune will be awesome. Although I already like the stock performance of the car. I'm waiting for some exterior modifications. Maybe a front lip kit of some sort. Unsure how the new 6 will look with eyelids, but that's something to consider. Last edited by Vance Kromo; 03-08-2013 at 04:11 PM.